This is the easiest way to make your own hand sanitizer using essential oils! Cold and flu season is in full swing, and with H1N1 running around all over the place, taking a few extra precautions to keep germs at bay is never a bad thing. I’m not saying you need to bathe yourself and your kids in hand sanitizer every few minutes. Washing your hands with soap and water is still the best way to get rid of germs. But after an outing where you come into contact with a lot of germs (like the grocery store, the gas pump, public bathrooms) it’s a good idea to kill off some of those foreign attackers when you don’t have access to a sink and soap. And when you have an 11 month old sitting in the grocery cart who insists on putting as much of the cart in her mouth as possible, you like having a little piece of mind that your daughter isn’t going to break out in hives from all the germs at any moment. There are many, many hand sanitizing products on the market, but I’ve found that you can make your own hand sanitizer for a fraction of the cost. Most products you buy are made with an alcohol base but as the green craze continues, more natural products made with essential oils are finding their way to the market. If you elect for an alcohol based product, make sure it has an alcohol concentration of at least 60 percent so that it kills most harmful bacteria and viruses. Check those labels on your hand sanitizer products so you know they are actually getting the job done and not just smearing the germs around. Essential oils have been used for thousands of years to combat disease and you may already have all of the oils in your home that are necessary to make your own hand sanitizer. Using essential oils with disinfectant, antiseptic and antiviral properties will allow you to create a homemade hand sanitizer with no alcohol at all. Cedarwood, lavender, lemon, lemon grass, myrrh, neroli, patchouli, peppermint, rose, sandalwood, tea tree, thyme and ylang-ylang essential oils all have antiseptic properties. Clove, niaouli and pine oils have both disinfectant and antiseptic properties. Tea tree oil is the most powerful of these essential oils and has antiviral, antifungal and antibacterial properties–making it the recommended essential oil to use in the following recipes. But it should not be used on infants or pregnant /nursing women. Adding more tea tree oil to any recipe will make the hand sanitizer more effective but the smell can be overwhelming. View the American Society for Microbiology’s study about TTO for further information about its effectiveness. A few drops of essential oils like basil, rosemary, rose, lavender, lemon or geranium will lighten and balance the aroma. Always be careful with essential oils and consult an herbalist before using if you have any current health conditions. As mentioned, some oils (like tea tree, cedar wood and hyssop) are not suitable for children or pregnant and nursing women. In the recipes below, you can mix oils to suit your taste or just use one type of oil, but their effectiveness will be reduced versus using tea tree oil. One essential oil blend option which is safe for families is a combination of lavender and pine. This will create a disinfectant, antiseptic hand sanitizer with calming effects. Add a little citrus or rosemary to enhance and round out the aroma. Aloe vera gel is an ingredient in all of these recipes and I just wanted to mention that this means pure aloe vera gel without the coloring, flavoring and so on. It’s not the same as juice. It should say “100% aloe vera gel” somewhere on the bottle. If it doesn’t, it’s the wrong stuff. If you have trouble finding any of these ingredients in your local stores, try online sources. I’ll be happy to give you a few sites myself. 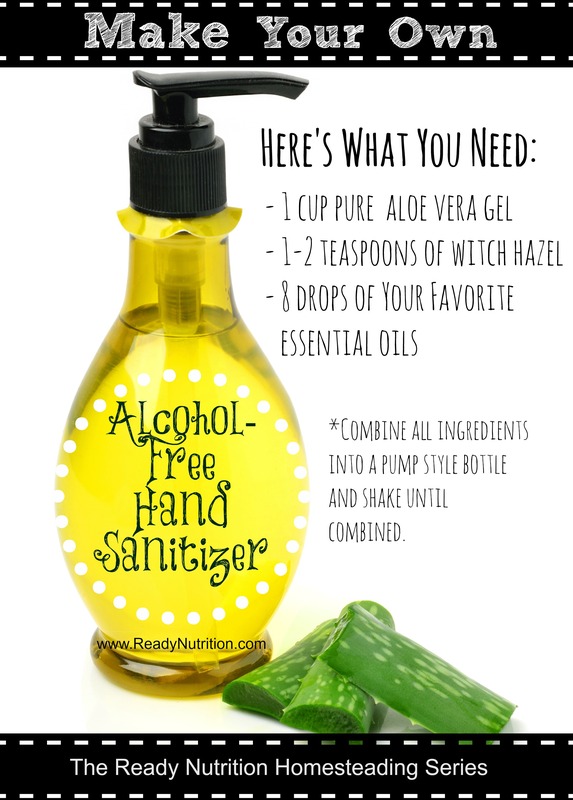 So here’s the homemade hand sanitizer recipes with and without alcohol. Mixing up a batch of hand sanitizer only takes a few minutes but there’s often a question of what you have available in the house. You’ll probably want to do the mixing in a glass bowl (plastic may take on the aroma of the essential oils and metal may react with the ingredients) but you can also just pour the ingredients directly into a bottle if you prefer. Either way, a funnel is going to be useful. Add the ingredients together in your mixing vessel, then shake or stir to combine. Fill the mixture into hand sanitizer and other small bottles you’ve washed out to keep those landfills empty. Some more liquid recipes may need to be shaken before use to distribute the oils. Thanks for sharing my hand sanitizer recipes! It’s always nice to know that there are alternatives out there to all the chemicals — not to mention easy things you can make at home! uhmmm. can you use eucalyptus oil or olive oil? Great question! Yes, you can use eucalyptus oil in your sanitizer. Naturally, it has antibacterial and antiseptic properties.